Boasting city views, Junior Suites offer more space with a king-size Hilton Serenity bed in a master bedroom and an extended living area with a queen-size sofabed. 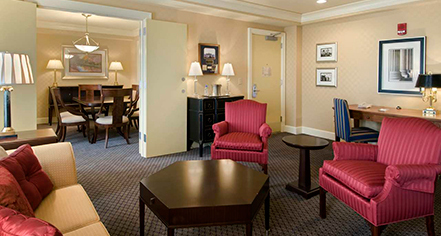 Guests can enjoy complimentary WiFi and on-demand movies on the 42-inch LCD television. Comprised of a bedroom and separate parlor area, One Bedroom Suites are appointed with subtle earth tones and warm blue accents. Ideal for both lounging and working, the parlor area is appointed with a queen-size sofabed, two accent chairs, coffee table, games table with seating for four, and a mini refrigerator. 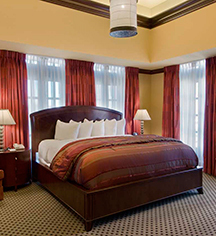 The spacious, comfortable bedroom is furnished with a king-size bed, luxurious, allergen-free down comforter, and mattress set custom-designed for added support and comfort. Boasting 890 square feet of space, the Reagan Suite is comprised of a bedroom, dining room that seats up to six, living area, and a kitchen with a full-sized refrigerator and microwave. Ideal for entertaining, hosting intimate meetings, or relaxing, this elegant suite is thoughtfully-decorated with one-of-a-kind artwork, including an actual piece of the Berlin Wall. Guests of this suite can catch up with work at the separate seating area, and watch a movie on one of the two 55-inch HDTVs, or relax in the master bath featuring an oversized shower. Luxurious full marble bath with whirlpool tub and oversized shower, and private water closet. Two 55-inch HDTVs with premium channels and on-demand movies, and a Nintendo Wii gaming system.